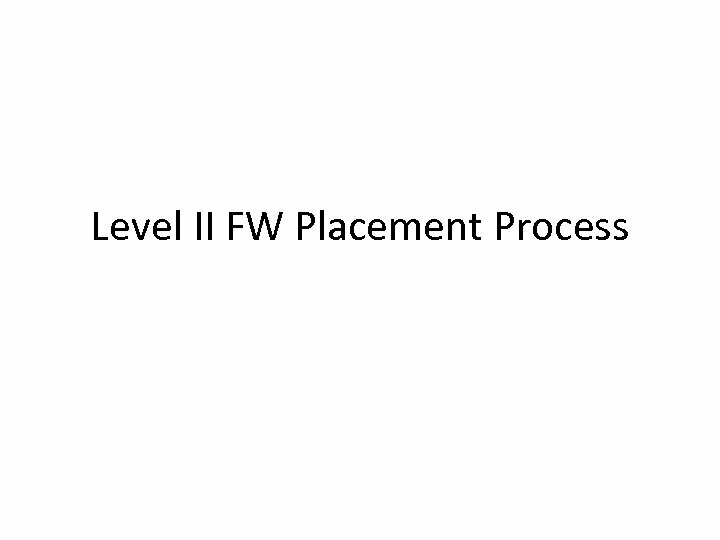 Level II FW • A full-time internship. 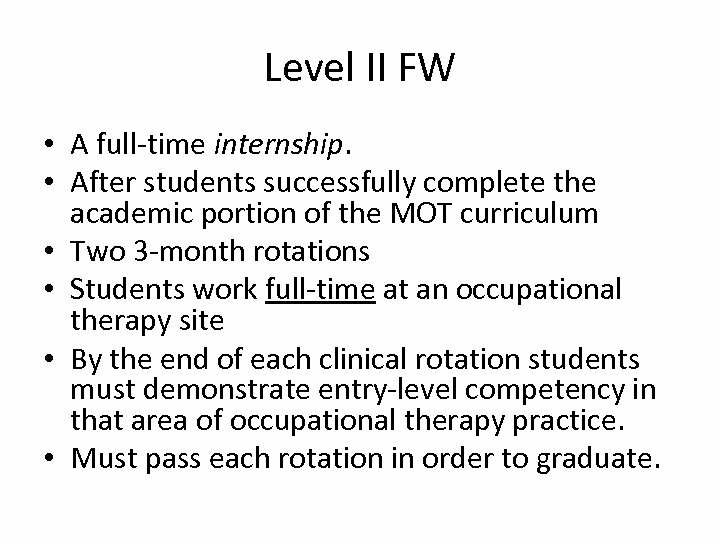 • After students successfully complete the academic portion of the MOT curriculum • Two 3 -month rotations • Students work full-time at an occupational therapy site • By the end of each clinical rotation students must demonstrate entry-level competency in that area of occupational therapy practice. 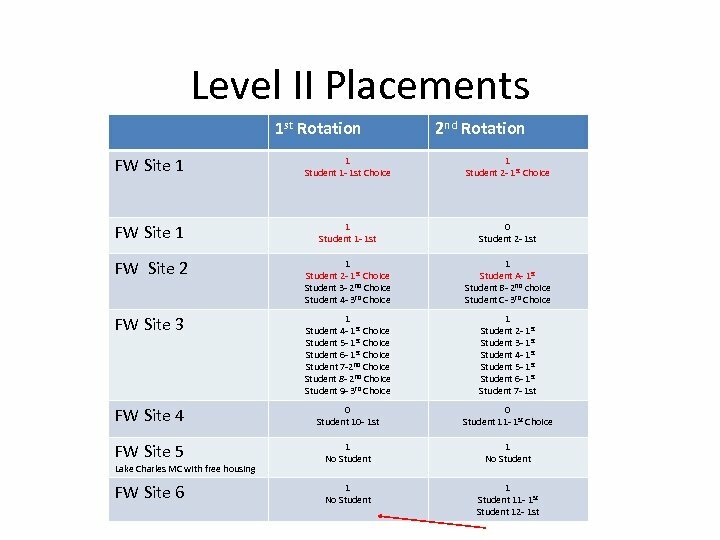 • Must pass each rotation in order to graduate. Do I Get To Choose? 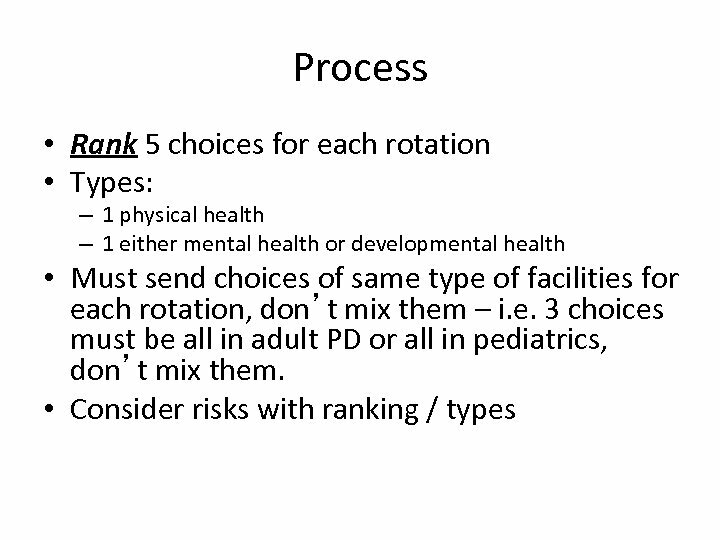 • Yes, to an extent • Submit ranked list of top 5 preferences for EACH Level II rotation. 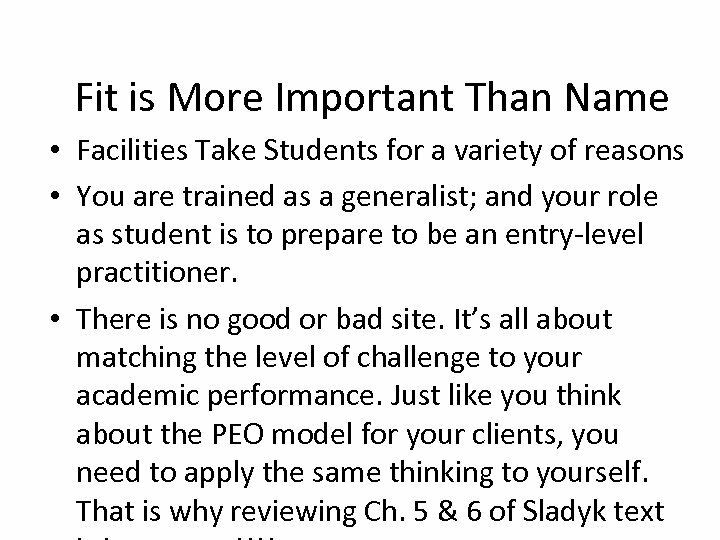 • No guarantee that students will get their selected sites. 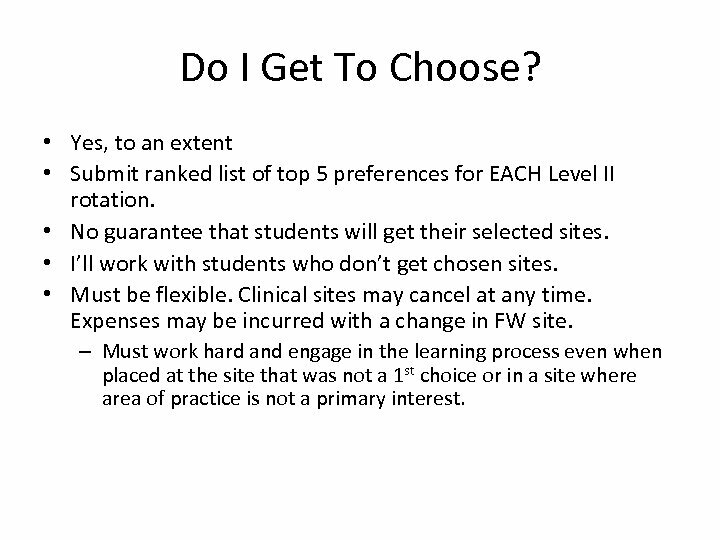 • I’ll work with students who don’t get chosen sites. • Must be flexible. Clinical sites may cancel at any time. Expenses may be incurred with a change in FW site. – Must work hard and engage in the learning process even when placed at the site that was not a 1 st choice or in a site where area of practice is not a primary interest. When are Requests Due • Requests are due at the time of meeting with me. • You must review Ch. 5 & 6 of your Sladyk Text before meeting with me & finish a worksheet reflecting on your strengths and weaknesses (Posted after Level I FW). 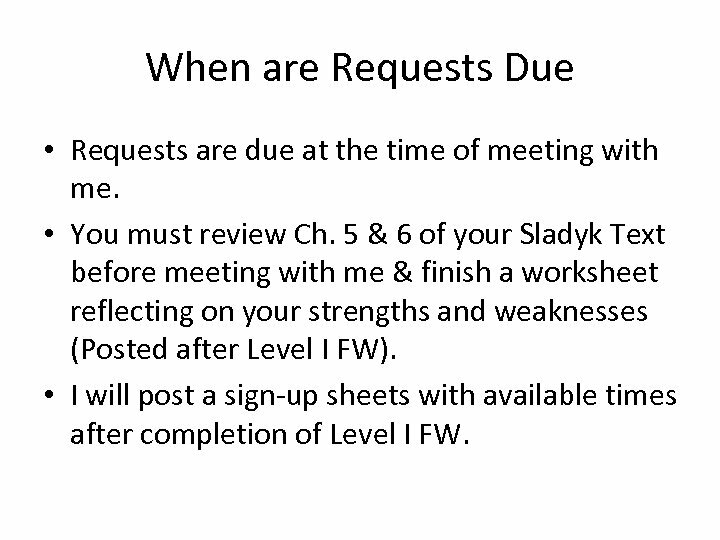 • I will post a sign-up sheets with available times after completion of Level I FW. Take Note: • Delivering Your Confirmations to you is rewarding! Some tips on making this process go smoothly. – Avoid emailing me repeatedly regarding your placement. If you don’t hear from me, I am probably waiting for a facility to get back with me. 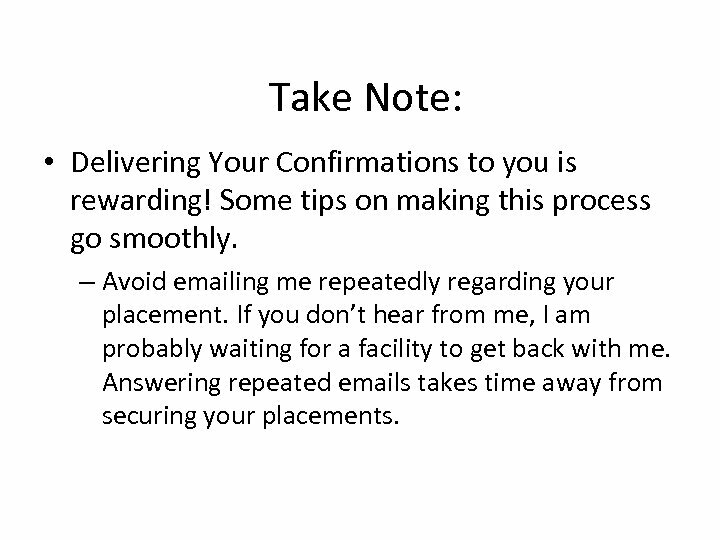 Answering repeated emails takes time away from securing your placements. Take Note: • You are NOT PERMITTED to contact any fieldwork sites until you are confirmed with a placement or have been permitted to do so. 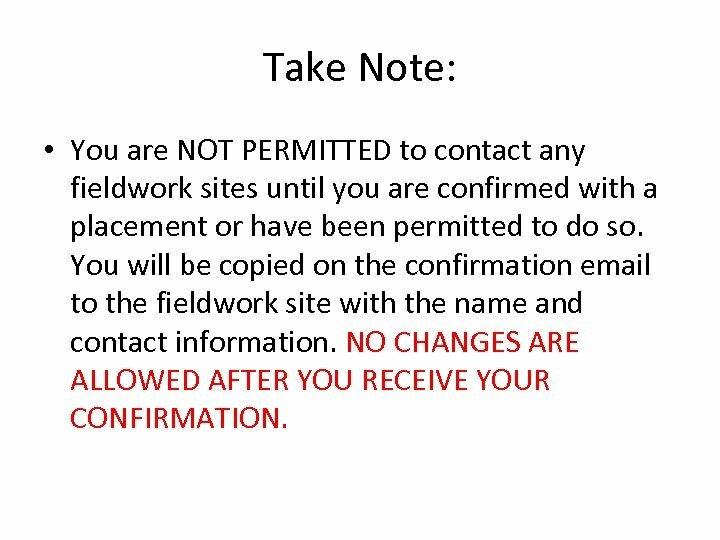 You will be copied on the confirmation email to the fieldwork site with the name and contact information. NO CHANGES ARE ALLOWED AFTER YOU RECEIVE YOUR CONFIRMATION. 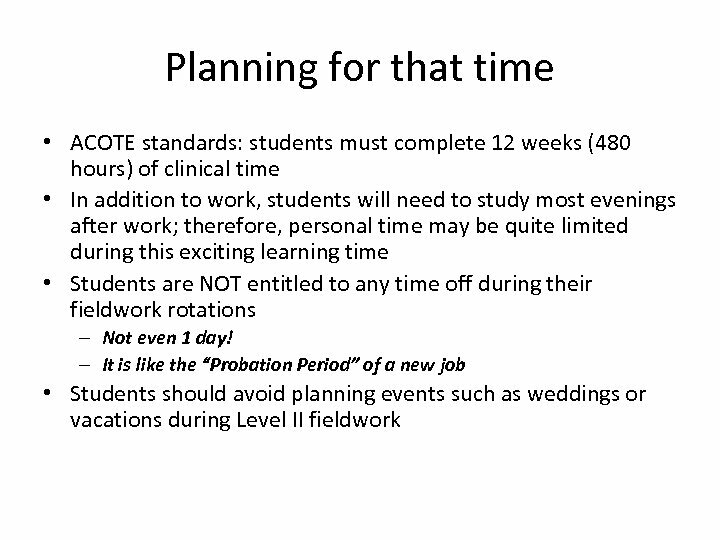 Take Note: • I will be working on this most of the summer semester. Some may get confirmations sooner than others. 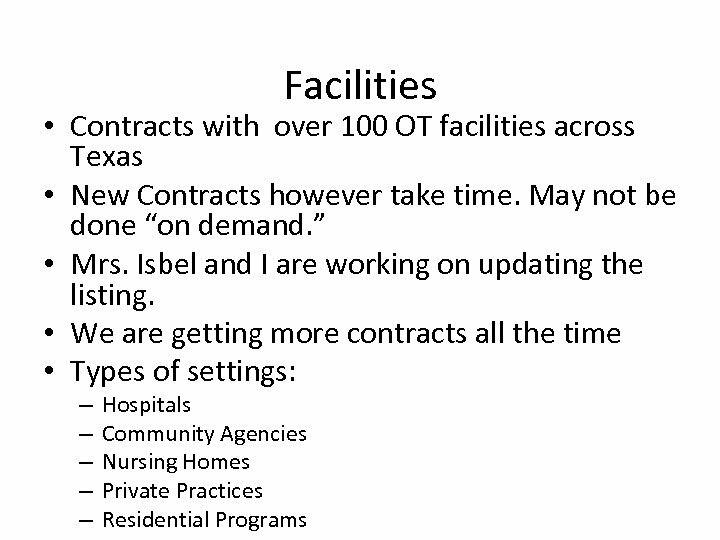 – You may contact the facility and ask to take a tour etc. 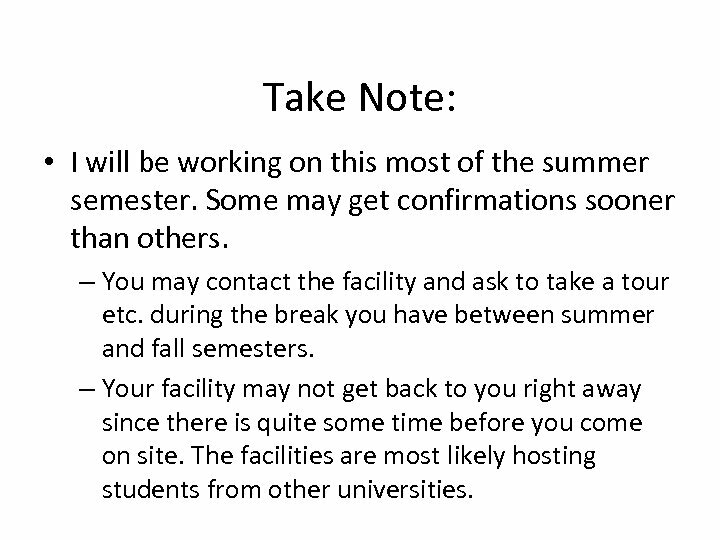 during the break you have between summer and fall semesters. – Your facility may not get back to you right away since there is quite some time before you come on site. The facilities are most likely hosting students from other universities. 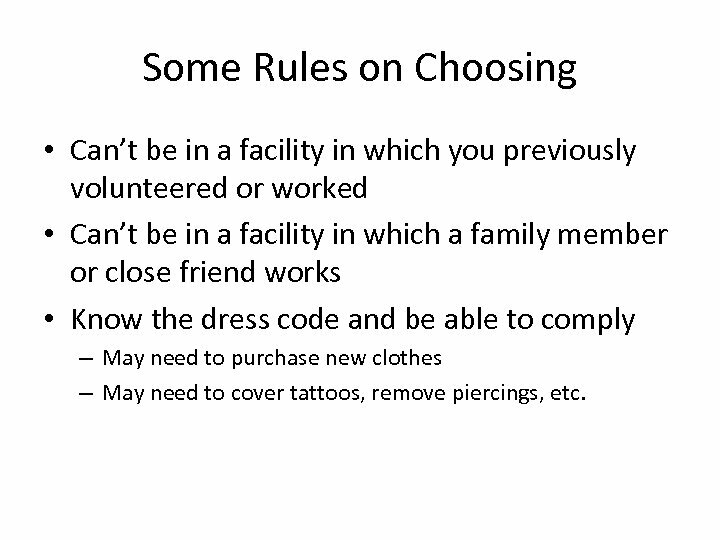 Some Rules on Choosing • Can’t be in a facility in which you previously volunteered or worked • Can’t be in a facility in which a family member or close friend works • Know the dress code and be able to comply – May need to purchase new clothes – May need to cover tattoos, remove piercings, etc.